The delay in the launch of Vista and the next version of MS Office has estimated to have cost Microsoft some $100 million per month in lost revenue. The overall PC market has also suffered a drop of up to 20% in sales as customers postpone purchases until the release of Vista, with heavy discounting of PC's and components as stock piles of unsold inventory build up. To counter this Microsoft is issuing discounted upgrade vouchers costing the company upwards of $1.5 billions to build demand and to support the PC market suffering from the delay. Improved Software Setup and Maintenance - Create and store hard drive images. Windows Meeting Space: For business to communicate between offices. Windows Vista will not allow kernel manipulation. So all the money you folks have invested in security software that uses this will not work with Vista. Microsoft wants you to rely soley on his security software only to protect that computer. I can see a lot of refunds being made when people purchase Vista and get it home and find out they can't use their own choice of security. I'm running XP Pro and have multiple image backups. I will run it even after it's not supported anymore because I refuse to be told what software I can use on my own computer. I'm wondering how much longer he will support XP in order to force people to Vista. I have been looking at alternatives for when this time comes. By then I will have figured out what I'm going too and it won't be windows unless there is a major change in Vista, but I doubt that. This is only in 64-bit Vista and not 32-bit Vista. 32-bit Vista still allows you existing security software vedndors to make the same hacks into the kernel that they've being doing for years - even though this isn't supported. 64-bit Vista locks this down to tighten security and increase stability - okay, as long as Microsoft will allow the security guys to have supported API's that allow them to develop their next generation of security tools. So there are two versions of windows Vista being released ? Whats the point of 32bit vista ? since its just old technology dating back 10 years ! I think I will leave it for a year at least so as these items are ironed out. Reading the comments it looks like there is some confusion on Vista, so heres some help for you people ! * You can only install the x64 version of Vista if you have a 64-bit processor. * In Vista x64, any driver that is not properly signed will not be able to enter the kernel and will fail to load. * Vista x64 does not support 16-bit software. 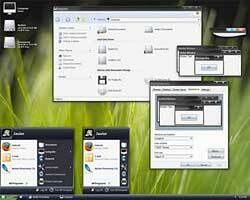 Most users with 64-bit hardware should install the 32-bit (x86) version of Vista. The lack of 64-bit drivers for most current hardware will be very disappointing and frustrating to most users. The performance gains promised by 64-bit will not be seen for years until 64-bit compiled versions of software is the norm. So stick with XP or 32bit Vista ! Microsoft had to implement a fix after a secuirty expert demonstrated a hack that could bypass security protection built into 64bit versions of Vista in order to inject potentially hostile code into the kernel. But the fix prevents legitimate applications, such as disk editors and recovery tools, from functioning without their own signed kernel-level driver. Hackers might be able to hijack the legitimate drivers so all Microsoft has done has created extra work for developers in displacing - but not resolving - the problem. So much for Vista 64bit kernel security ! There are PLENTY of 3rd party security solutions for Vista. They just have to be designed for Vista. One of the best (Avast Antivirus which is free), works perfectly on Vista. The reason why security vendors are up-in-arms are because they are trying to push into the kernel which Vista does not allow. By protecting the kernel, Vista is already immune to a vast number of viruses. Additionally the reason for 32bit versions of Vista is because not everyone has a 64bit processor. Additionally, the main benefits are better memory allocation however the performance difference is minimal. whats about the graphics, are they any good ? I am very disappointed in the "NEW" Windows Vista program. There is a HUGE problem with the email portion. The Security program causes continual problems with blocked emails both incoming and outgoing. For those of us that aren't "computer geeks", this is overwhelming. It is shameful that a product which apparently was pushed back on the production date was still allowed to be issued without fixing this BIG BUG.